Review date: 30 October 2000. It comes in a shiny metal biscuit tin. It has an instruction manual. It has three parts, one plastic, one rubber, one steel, and requires some assembly. Part of it is reversible. Honestly, sometimes I think it's time to throw in this business and take up turkey farming. This is not, of course, just any mousemat. This is the "fUnc Industries sUrface1030". This title may represent the first tentative venture of studlycaps into product naming. Oh well. At least they didn't use süperflüöüs ümlaüts. The sUrface1030 sells for US$24.99, plus shipping, from Silicon Horizon, who provided me with the review mat. Silicon Horizon were based in Singapore, served the Asia-Pacific region, and went out of business some time between the end of 2000, when I first wrote this review, and the start of 2004, when I'm updating it. You can buy fUnc mats from various dealers; it lists for about $US20 ex shipping. If you're in Australia, you can buy the sUrface1030 from Aus PC Market. It costs $AU60.50 including delivery, because importers still have to pay for shipping for that big biscuit-tin case. The biscuit tin's now a bit less bloated than the one in the picture above, but there's still no economical way to ship these things internationally, so the Aussie price is on the high side. Live with it. Why, I hear you ask, would you want to pay for this extraordinarily elaborate version of a very basic computer accessory? Well, because it's really nice, that's why. Here's what you get in the tin, along with a little care-and-feeding guide. One "mousing surface", one rubber mat, one little metal clip. Feel free to mentally shuffle the capitalisation when I say "Func" and "Surface" from now on, by the way. My patience for typographic novelty has been exceeded. The surface itself is a slab of plastic, with a different texture on each side - one rougher, one smoother. The surface fits into a depression in the floppy rubber base pad. It's a tight fit - you have to run your finger around the edge of the surface to pop it into place. The base feels like a rubber car floor mat, and should keep the mousemat well stuck to most desks. I got the blue-mat, black-base version; there's another version with an orange base, and other variants are in the pipeline as well. Whenever you pick up the mousemat, the stiff surface pops out of the floppy base, and you have to replace it. It doesn't happen when the mousemat's just sitting on the desk, though, so it's not a major annoyance. The cable clip hooks into one of six holes in the top and sides of the rubber base. You don't have to use the clip, but if you do, it lets you anchor a loop of mouse cable in a convenient spot, so you never find yourself yanking extra cable up from behind the desk or knocking things over when you move the mouse. It's a small feature, but a pleasing one. This is all not quite as insane as it sounds. Many computer users seem to have an amazing tolerance for crumminess in their cursor-shifting hardware. Dodgy old serial mouses that update the pointer location only 33 times per second - a leading cause of revulsion in Mac users who switch to a PC for the first time - adorn many desks. And they're never bloomin' cleaned, and they're used either on the slick, low grip desk surface itself, or on some ghastly piece of cloth-covered wetsuit fabric specially designed to grab every particle of dust in the room, mix it with sweat and skin grease, and jam it into the mouse's moving parts. Having, in the final analysis, an effect not unlike that caused by a tube of tile grout squeezed through the keyhole of a cuckoo clock. If this doesn't bother you, then you're not part of the Func target market. If crummy mouse accuracy drives you nuts, though, then a "premium" mousemat like the Func, or the earlier EverGlide or Ratpad or 3M Precise Mousing Surface ("PMS") mats is for you. I deal with these earlier products in my review here; in brief, the PMS was the first of them, and is a low profile floppy thing, while the EverGlide and Radpad are slabs of plastic resembling shaped kitchen cutting boards, and are ultra-tough. A premium mousemat doesn't collect dust as quickly as a cloth mat, doesn't transfer dust as well to the mouse, doesn't cause lots of friction, and lets you position your pointer more accurately. This helps a bit in everyday desktop tasks, but it helps a lot if you're doing something where mouse accuracy matters - graphics editing, or games. An inaccurate mouse is very annoying when you're trying to do fine work in your favourite image editor, or put a simulated rifle bullet through the earhole of some upstart kid in Sweden. And as far as accuracy and cleanliness goes, the Func mat seems to be right up there with the best. I've used it for a couple of days, now, and I like it. Of the two sides the surface offers, I much prefer the rougher one. The smooth side, because it's got more points of contact with the mouse feet, gives a bit more friction - not less, as you might think. This may help with fine mouse positioning. But it also creates considerably more drag on the user's hand, particularly on hot and sticky Australian days. Like every other mousemat except the white, translucent EverGlides, the Func mat also works fine with the new breed of optical mouses, like Microsoft's optical IntelliMouse series (reviewed here and here). These mouses don't need a special mousemat, like earlier opticals, but they do need something with a bit of texture for their little camera to track; the Func mat provides it. 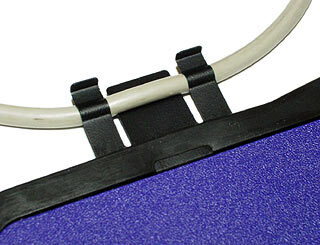 I first wrote this review in at the end of October, 2000; by the end of 2001, the Func mat was worn out. Its rubber under-mat developed some annoying ripples on one edge that made it impossible to seat the mat in it properly, and the mat itself got polished smooth on the side I wanted to use, to the point where my optical mouse (by then an IntelliMouse Explorer 3.0) started skipping in some areas. This, though, was after 14 months of continuous, intensive, more-than-eight-hours-a-day use. So I'm still pretty pleased with the Func; it lasted very well. Hard plastic mats like the Everglide models last longer, but not forever; they'd work as a cutting board for years on end, but they polish down over time too. If you've already got a premium mousemat, I don't think you need this one. It's a pleasing hybrid of the low-profile 3M mats and the super-tough thick plastic ones, and its two sides should suit any user. The cable clip's a nice touch, and it's big enough that even people who like their mouse speed low are accommodated. It's washable, it's not easily damaged, it stays put and it doesn't wobble. The rigid EverGlide and Ratpad mats need to be propped up with little blobs of Blu-Tack on my slightly warped desk; the Func doesn't. And whatever's printed on it is, apparently, unlikely to come off; the mat has a sandwich design with a see-through layer on top of the printed one. EverGlide printing slowly rubs off over time. But the fine art of mousemat design has, I think, been taken about as far as it can. If you're using some awful piece of wetsuit fabric, this could be the best $US25 or so you could spend on your computer. If you've got a good mat already, though, you'd have to really like shiny biscuit tins to feel the need for the Func. I used it, but I wouldn't pay for one, because I've got lots of exotic mats here. If you haven't, a Func is a fine one to start with, if you don't mind the price. fUnc sUrface1030 kindly provided by Silicon Horizon. and blue with orange rubber.